Nehanda Imara is an adjunct teacher for African American and Environmental Studies at Merritt College. She created the first Environmental Racism/Justice course for the Peralta Community College District. Nehanda is on the steering committee for Sustainable Peralta and she is on the Board of Directors of Leadership Excellence. 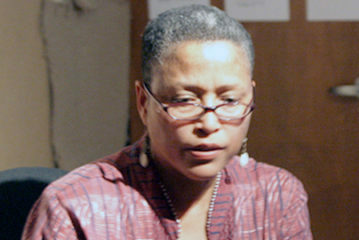 As a part-time faculty member of Peralta Community College District, she leads student groups to Ghana through the only Study Abroad Program that has as a focus, “Black Consciousness Raising Tours of Africa and the African Diaspora.” In the past twenty-five years, Nehanda has traveled to over 10 African countries as well as the Caribbean and Central America. In November 2006, she organized the first Environmental Justice Hip Hop event at Laney College to bring awareness to Environmental Racism in Oakland. Nehanda is an Oakland, CA resident and she has one daughter that is a doctoral candidate at University of California, Berkeley and is the only African female doctoral candidate in the area of astrophysics. Nehanda has been a freelance writer for many years writing book reviews for San Jose Metro (1990’s) of Black women novels and for various newsletters about the struggles related to the lives of African peoples and other social justice movements. Nehanda plans to repatriate to Africa, completing her pan African mission to live in Ghana and continue the building of youth bridges from Africa throughout the Diaspora.